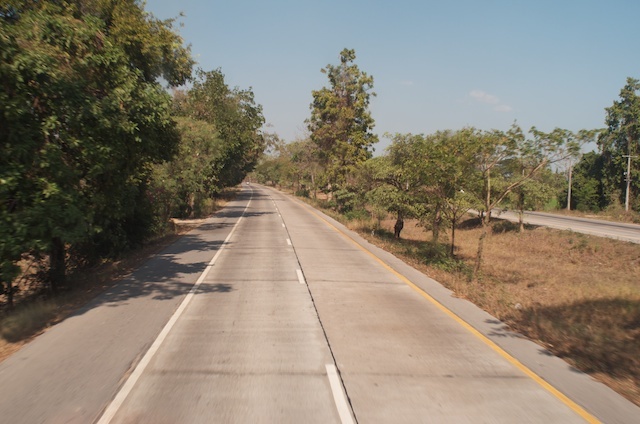 A Tech-free Weekend (1): Bangkok to Uttaradit - in which we see a former political strongman riding his motorbike; and a colleague talks about the iPhone2 he still uses. On occasions I have to wear my other hat and leave Bangkok, computers and software behind. 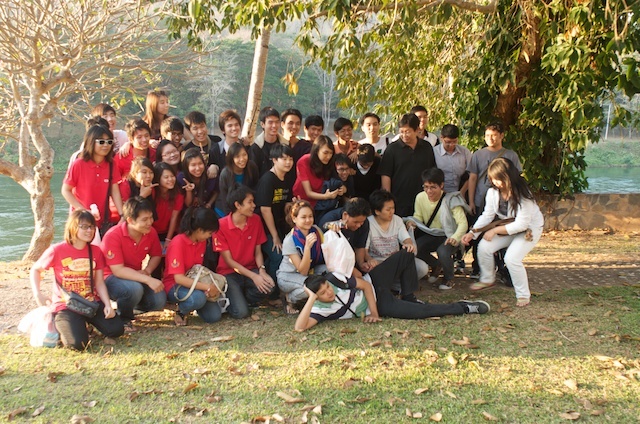 This weekend I am with the students and some of the teachers in the province of Uttaradit, staying at the Sirikit Dam. This is Day One of the events round the trip. There was an early start and that needed me to be at the campus for an 08:00 departure. We left at 08:18 (not bad). I was slightly worried I might be late, but the taxi driver made sure I was not, taking full advantage of empty lanes: most Thai drivers seem averse to anything but the misnamed fast lane. I picked up my second camera from the office, along with a spare iPhone charger. To lighten some of the load in my bags, I donated a bottle (with suitable contents) for Saturday night's usual celebrations. There were suitable sounds of approval from the guys. As usual I staked my claim upstairs at the front of the bus: a good view and slightly separate from the students who gravitate to the rear seats. A college grabbed a seat on the left of the aisle near me and was asleep in seconds. How does he do that? 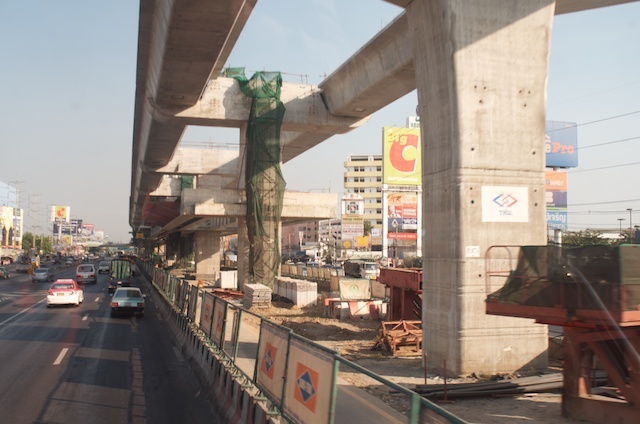 Up at Bang Bua Thong there was considerable construction for one of the new Skytrain lines. I had not seen this last time I came this way as I was inside the bus. With the amount of congestion, this line will make a considerable difference to commuters when it is running. There was evidence of other construction near the line, probably taking advantage of future links. We stopped for a bathroom break just north of Ayuddhaya around 09:30. There was a group of motorcyclists there having a break. From what I could see most of the bikes were BMW and there was an R80g/s like I had owned a few years back, but with the Paris-Dakkar tank (far greater fuel capacity). The bike had also been looked after much better than mine. I spoke to one and the group was on its way to Chiang Mai. Not long after we left there was a major holdup on the highway, but it was not an accident. The police were stopping all traffic. They had pulled several cars and trucks from the line and were checking these more thoroughly. Mercifully, the students asked for the loud music to be turned off. They wanted to play guitars and sing themselves: much more relaxing. Other students were playing cards (no money involved). We passed a large sign with a crash helmet silhouette and the display, "100%". Abut 100 metres further on were two small bikes -- two riders, two passengers. One passenger wore a helmet: 25%. Even though we were travelling on the main highway the the north, it was nice to get out of the city again. On either side, not too far from the road, there are some lovely views of the surrounding countryside which was still flat: no hills in sight. Flat, green areas of rice fields, edged with trees and the occasional building: so typical for this part of the world. And in the fields, specks of white as herons and egrets do their part in the chain. With the 3G signal intermittent here - not far from Chaiyo and to the west of Lopburi - satellite displays on the Maps app were too slow, although the maps loaded OK. The movement of the bus on the map was quite accurate. As I expected, the students stopped singing and there was some quiet - at least for a while. Downstairs in the driver's cab, as well as two-way radio to the other bus, the crew had mobile phones that they used, of course, and a Thai-language GPS system: "Another 10kilometres" was one announcement. I checked Maps on the iPhone andsaw that there was a major intersection coming up: Highway 32 which we were on; and Highway 1. I really like the way zooming in and out works on the app with the different data displays. 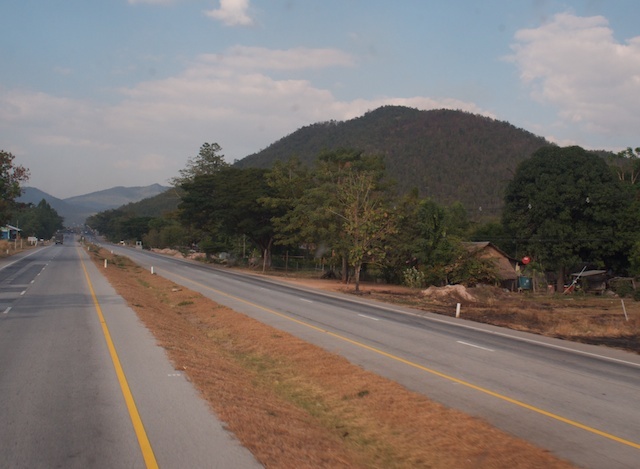 We continued on the 32 towards Nakhon Sawan where I expected we would switch to another road as we needed to go further to the East. I started looking at the many trucks with chemical codes, depending on what they carry, and other codes that indicate what actions should be taken if there are problems. The 4-digit UN Code tells you what the chemical is, such as 1075 for LPG. The number and letter codes, such as 4YE (E means "evacuate") shows actions. I learned all this years ago when I was a policeman in the UK, so I was interested to see an announcement from the Thai government (on Thursday) saying that as from next year, all such trucks would have to display large orange boards to show the information. As well as the codes, an icon to indicate the type of substance, along with emergency contact numbers and other information: all about 35 years too late. For years here, the responsible companies have had good information displayed; but of course it is those who are not responsible that will always cause the problems, orange boards or not. Lunch was at a fairly small roadside restaurant just south of Nakhon Sawan. We had not been there before as a group, but the bus crew had. 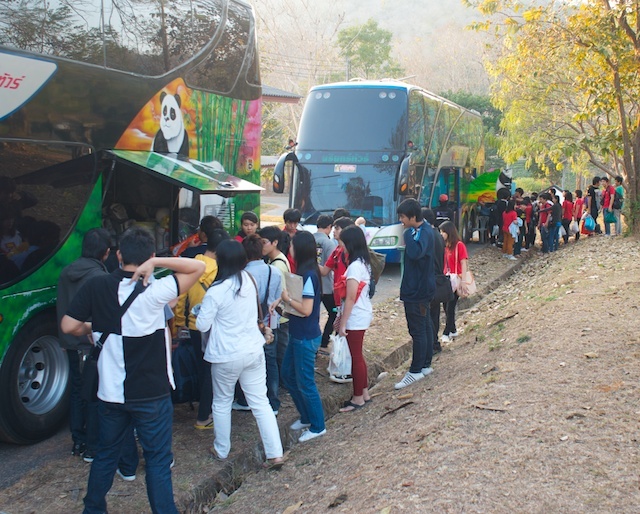 There were also other buses from the Bangkok - Chiangmai express routes there. Lunch was . . . OK.
After lunch my colleague was awake so we chatted about the students, about teaching, about presentations and writing skills. The chat was quite wide-ranging, but as he had been playing with his 3D printer all night, he was tired and dozed off again. He was one of the early iPhone owners in Thailand as he bought his iPhone2 while still studying in the USA. I noticed last week some considerable comments on the point that one user still had his iPhone 3G; but my colleague is still using his iPhone2. 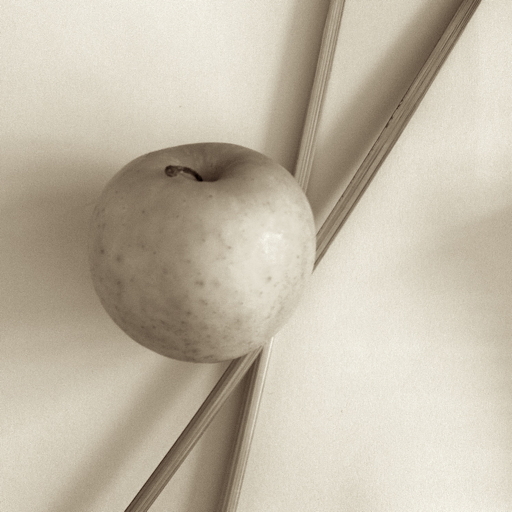 His main reasons revolve round the phone (of course) and the way that Outlook on his PC synchronizes his contacts. 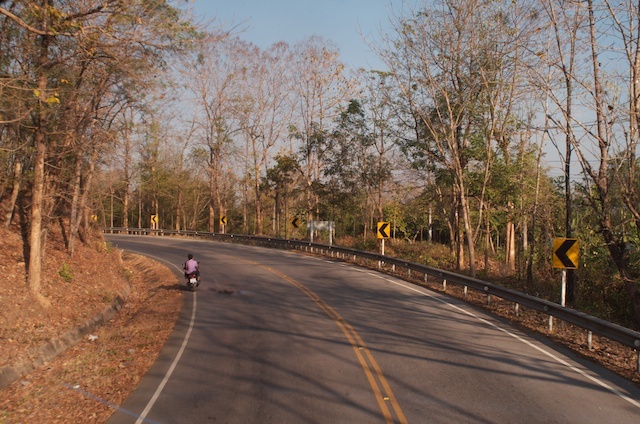 Just south of Phichit, a stretch of road under repair reduced the width to one, rough lane. The driver slowed while negotiating this. For part of the stretch, there was no tarmac, so the road was dusty, despite water spraying, which I always think makes it worse as the dust is ground smaller and smaller. At Phitsanulok, not long after passing the campus of Mahasarakham University, we turned off to the left, to avoid going through the city. Although Uttaradit was not yet sign-posted this looked like the last (200 Kms) leg, although there were still a couple of road changes and then the final few kilometres to the dam. There was no 3G, the battery was low and I needed the bathroom. We stopped at an intersection. As the lights changed, our driver moved off, gently through the gears, passing another tour bus. The second bus raced the engine through the gears and was soon ahead. Our bus driver just held back. At the next junction, the other bus turned off: nobody won. 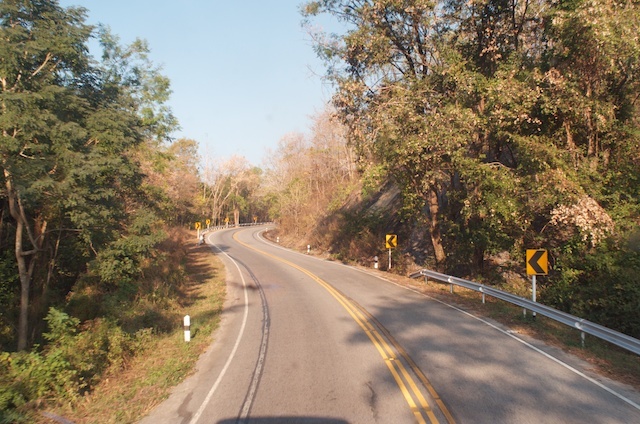 We eventually reached Highway 11 and Uttaradit was at last shown on the signs. 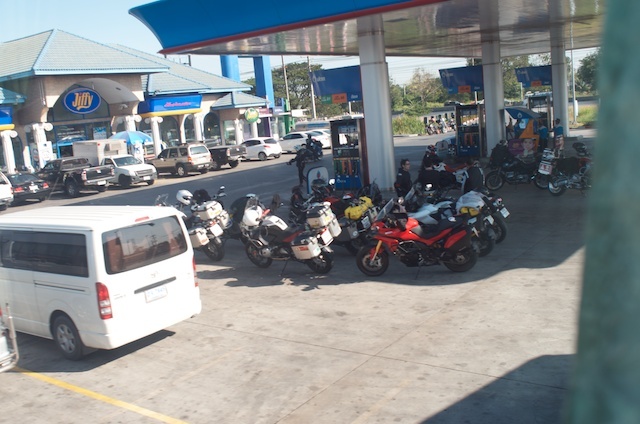 Not long after, we stopped for fuel and a very welcome bathroom break. Another group of large motorcycles - a mix of BMW and other makes - pulled in and while we were there some of the students started chatting to one of the riders. This was Newin Chidchob, a famous (perhaps infamous) politician. He was happy enough to shat to my students and was willing to be photographed, so this shows a pleasant side. He rides motorcycles for Heavens' sake. As much as I would like to ride again, it is a case of been there, done that: we have moved on. 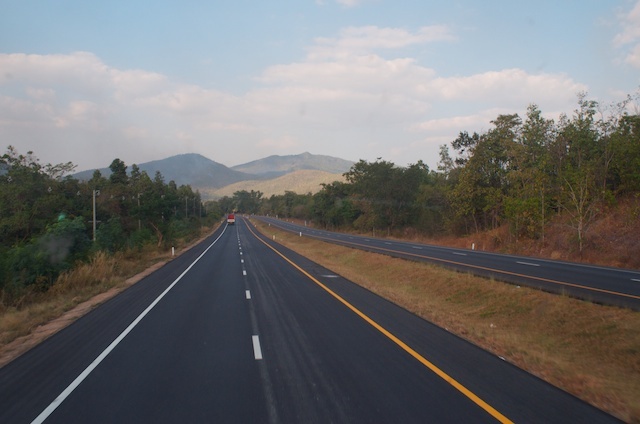 Although the road looked flat, I could feel that we were climbing gently towards Uttaradit. In the distance and to my right I could see a line of hills. The highway also became sinuous. From memory of having ridden the road in the opposite direction, we had a steep and twisty climb ahead: it had needed some care coming down. 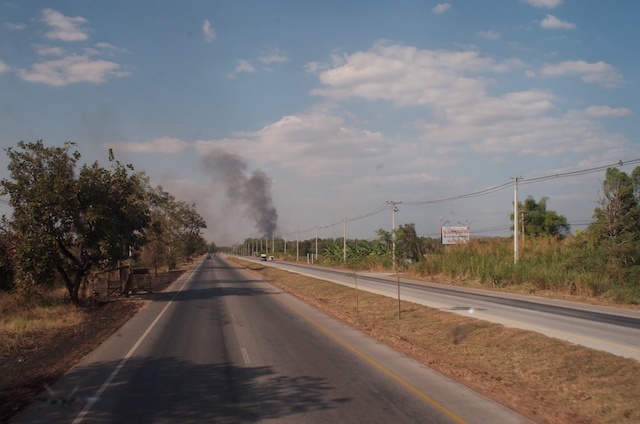 During the trip, I had seen smoke a few times: mostly associated with crop burning. But there was a dark cloud near the road which looked a bit more serious. Traffic did not appear to be slowing, and as we neared the smoke began to thin. It was again large areas of fields being cleared. Then the iPhone died: the first time I had run the battery right down. The ground was dry and in places there was not much green. Although it is January, it has not rained for weeks in this part of the country and in some places crops, like sugar cane and cassava, are being harvested. Some trees near the road had gorgeous autumnal hues: others were vivid green. While the hills came closer, the amount of burning thickened the air, making the hills less distinct at times. 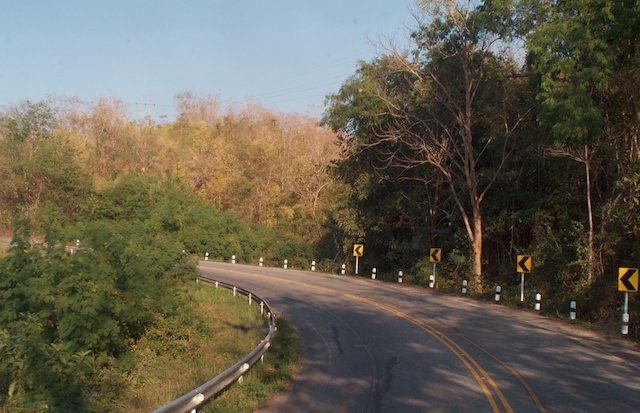 The climb began in earnest around 40 Kms from Uttaradit. Initially some downhill sections helped maintain the speed, but the rate dropped. Even in the middle of the afternoon, huge areas were in the shade from the hills. After the road had been level for a while, with the gentle rhythm of the bus along the tarmac, my eyes became heavy again. A sign welcomed travellers to Uttaradit, although this was the Province, not the town: there were still a few kilometres to go, and it was still all rural. There were also signs for Lampang and I hoped this might be included as part of the trip for a couple of reasons: it would be good for the students to see the massive lignite-burning plant along with the opencast mine, as well as the hydroelectric installation; and the road there is spectacular. I later found out this was not on the itinerary. Just outside Utaradit, the group of motorcyclists we had seen at the last gas stop, caught us up, headed to the front of the line at a set of traffic lights and were gone. Nicely done. 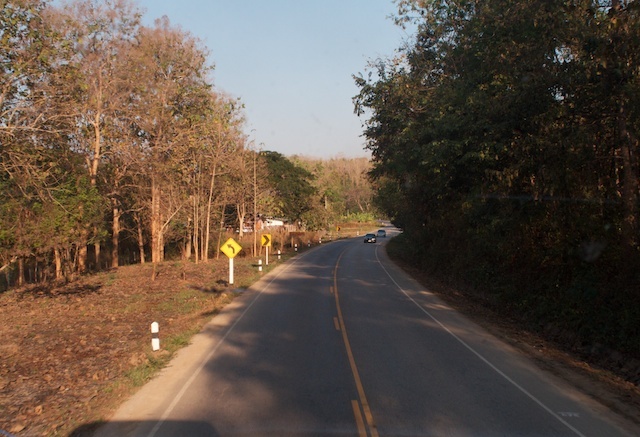 Shadows had begun to lengthen and we still had a few kilometres past Uttaradit to go. Below me the two drivers were still chatting over their radios, with occasional interruptions from Miss GPS. We turned right and just after she announced, "go straight" in confirmation when the turn was made. A school was turning out. 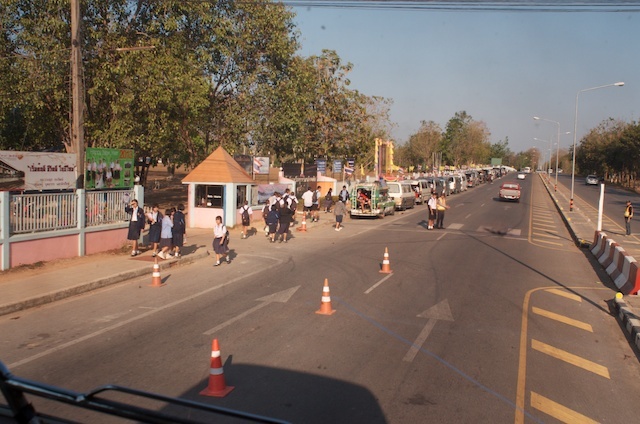 The road was coned and personnel were controlling traffic for those students who needed to cross. On our left were 20 or 30 vans and other transport waiting for their passengers. We were now on a 2-lane road with smooth, black tarmac, edged with trees. There was more to come. I remembered to the dam to be a narrow, twisty lane, cut through the hills: perfect for riding. This was the prelude; and signs for the Sirikit Dam began to appear. The driver slowed, taking account of hazards - motorcycles, dogs, vehicles turning right - and as he did, hos commentary was relayed to the other crew. Finally the Dam. The support staff collected the keys and some food. We booked into our rooms. I was disappointed as this was not the same accommodation we had last time, and the facilities mean sharing more with others in each of the houses. The area was cool and down by the river a brezze was blowing. After we had eaten, even I was beginning to feel the drop in temperature. The day was done by about 20:30.